As your family’s safety is the utmost important to us at Froglock, we would be pleased to help you choose the best mortise lock for your property from the large variety we offer. Most are widely used on residential front doors. These locks require a pocket or mortise be cut out of the side of the door to fit the lock body. Mortise locks also have a box keep into which the bolt slides. 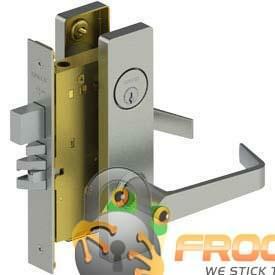 Froglock has numerous styles of mortise locks. They come in a large variety of styles to suit your décor and door size. We know how important your family’s safety is and make sure we only sell quality mortise locks at fair prices. Once you have chosen your lock Froglock locksmiths will be happy to make an appointment to expertly install the lock.